Slocum – The family of Helen Mary (Bateman) Slocum is saddened to announce her passing on Friday, November 30, 2018 in Summerside, PEI at the Prince County Hospital at the age of 93. Helen lived a blessed life always in good health and surrounded by good friends and family. Helen was second in a family of six children. Upon completion of her diploma at the Mount Carmel Academy, Helen married the boy next door, Vernon Slocum. The young couple left their family homes in Rothesay, NB to settle in Ontario and raise their family. Throughout her lifetime, Helen was an active golfer and curler serving as president of the Dundas Valley Golf and Curling Club. Helen’s greatest passion was politics. Active with the Liberal Association, Helen helped to elect MLA’s Eric Cunningham and Chris Ward. Helen never backed away from a good political discussion. During their retirement years, Vernon and Helen wintered in their winter home in Panama City Beach, Florida. Surrounded by family and friends, Helen and Vernon enjoyed golfing, swimming, sailing, shuffle board and lively games of bridge. 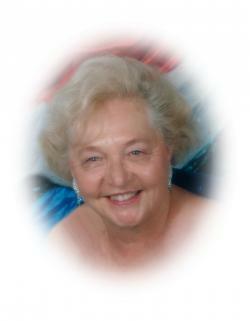 Helen cherished her friends and is noted as a member of a group that called themselves "Grannies on the Go". The Grannies on the Go would plan excursions and activities always committed to the notion of having fun with gal pals. Through this group, Helen kept in touch with friends she had had since childhood. Married for over 65 years, when Vernon passed away on August 20, 2014, Helen returned to her beloved Maritimes moving to Summerside to be close by her daughter and her grandson. Helen is survived by her daughter Nancy Joan Desrosiers; son Gregory Edward Slocum; grandchildren Gregory "Junior" Slocum and Jean-Paul "JP" Desrosiers (Shellilee Candace Ballum); great-granddaughter Maria Helen Jean Desrosiers; great-grandson Daniel Sheldon Desrosiers; sisters Barbara Bouchard and Marjorie Ouellette and families. Helen’s family would like to thank the staff of the Parkhill Senior Apartments where Helen resided until her passing for the excellent care they provided for Helen. Cremation has taken place. Resting at the Moase Funeral Home, Summerside No visiting hours or funeral service will be held on PEI. Forwarded to the Marlatt Funeral Home, Dundas, ON for completion of funeral arrangements. Memorial donations to the Prince County Hospital Foundation would be appreciated. Funeral to take place on a later date at the Marlatt Funeral Home, Kingston West, Dundas, ON. Memorial donations to the Prince County Hospital Foundation would be appreciated.